Read for This Week’s Study: Rev. 19:6-9, John 14:1-3, Rev. 19:11-16, Rev. 20:1-3, Jer. 4:23-26, Rev. 20:4-6; Rev. 21:2-8. Memory Text: “Then He who sat on the throne said, ‘Behold, I make all things new’. And He said to me, ‘Write, for these words are true and faithful’” (Revelation 21:5, NKJV). The destruction of end-time Babylon is bad news for those who collaborated with this apostate religious system. For God’s people, however, it is good news (Rev. 19:1-7). Babylon was responsible for inducing the secular political powers to persecute and harm them (Rev. 18:24). The destruction of this great adversary means deliverance and salvation for God’s faithful people. With the destruction of Babylon, the prayer of God’s people in the scene of the fifth seal, is ultimately answered. Their cry: “How long, O Lord?” (Rev. 6:10) represents the cry of God’s oppressed and suffering people from Abel to the time when God will finally vindicate them (Ps. 79:5; Hab. 1:2; Dan. 12:6-7). The book of Revelation assures God’s people that evil, oppression, and suffering will come to an end. It is now time for Christ to usher in His everlasting kingdom. The remaining chapters of Revelation describe not just the destruction of end-time Babylon but also the destruction of Satan and all evil. We get glimpses, too, of the establishment of God’s everlasting kingdom. Study this week’s lesson to prepare for Sabbath, March 30. Read Revelation 19:6-9 along with John 14:1-3. How does a wedding supper appropriately illustrate the long-awaited union between Christ and His people? In the parable of Matthew 22 the same figure of the marriage is introduced, and the investigative judgment is clearly represented as taking place before the marriage. Previous to the wedding the king comes in to see the guests, to see if all are attired in the wedding garment, the spotless robe of character washed and made white in the blood of the Lamb. Matthew 22:11; Revelation 7:14”. - Ellen G. White, The Great Controversy, pp. 426-428. After His death and resurrection, the Bridegroom returned to His Father’s house to “prepare a place” for His people, His wedding guests (John 14:1-3). They remain on earth preparing for His return. At the end of the world, He will come back and take them to His Father’s house. Revelation 19:8 states that the fine and clean linen was given to the bride by Christ. This apparel shows that the wedding guests who enter the city do not claim any merit for their deeds. Thus, the “fine linen, clean and bright” represents “the righteous acts of the saints” (NKJV), acts that came as a result of their union with Christ, who lives in them. Thus, these robes symbolize His righteousness and that His people “keep the commandments of God, and the faith of Jesus” (Rev. 14:12). While on earth, Jesus told a parable about a wedding. However, one of the guests preferred to wear his own attire instead of the wedding garment provided by the king, and he was expelled from the wedding (Matt. 22:1-14). Revelation 3:18 shows that the robe of Christ’s righteousness, the gold of faith and love, and the eye salve of the Holy Spirit are the greatest needs of God’s people living at the time of the end. Jesus’ offer that the Laodiceans “buy” these gifts from Him shows us that He asks for something in exchange for what He offers us. We give up self-sufficiency and trust in ourselves in exchange for a life of faithful obedience to Christ and trust in Him as our only hope of salvation. We are not saved by our works, but what “righteous acts” do you do that define the life that you are living? Read Revelation 19:11-16. What is the name of the rider of the white horse, and what does it mean that a sharp sword comes from His mouth? What does this tell us about how to be on the winning side in the end? What we see here is a depiction of Christ’s second coming, the fulfillment of the promise that believers in all ages have been longing for. Like Jesus, His people have based their faith on God’s Word. Revelation 19:11-16 is the culmination of Jesus’ many victories: Jesus defeated Satan in heaven; He defeated Satan in the wilderness; He defeated him at the cross; and He will defeat him at His return. “Soon there appears in the east a small black cloud, about half the size of a man’s hand. It is the cloud which surrounds the Saviour and which seems in the distance to be shrouded in darkness. The people of God know this to be the sign of the Son of man. In solemn silence they gaze upon it as it draws nearer the earth, becoming lighter and more glorious, until it is a great white cloud, its base a glory like consuming fire, and above it the rainbow of the covenant. Jesus rides forth as a mighty conqueror. Not now a ‘Man of Sorrows’, to drink the bitter cup of shame and woe, He comes, victor in heaven and earth, to judge the living and the dead. ‘Faithful and True’, ‘in righteousness he doth judge and make war’. And ‘the armies which were in heaven’ (Revelation 19:11, 14) follow Him. With anthems of celestial melody the holy angels, a vast, unnumbered throng, attend Him on His way. The firmament seems filled with radiant forms - ‘ten thousand times ten thousand, and thousands of thousands’. No human pen can portray the scene; no mortal mind is adequate to conceive its splendor”. - Ellen G. White, The Great Controversy, pp. 640, 641. In 2 Thessalonians 1:8-10, Paul gives another depiction of the ultimate victory of Christ at the Second Coming, when all the secular and religious powers, which had conspired against Him, are destroyed, and His people are delivered for all eternity. Revelation 19 describes two suppers, one in verse 9 and another in verses 17 and 18. At one supper you eat, at the other you get eaten. It’s hard to imagine a starker contrast of what’s at stake in the whole great controversy for every human being. What should this imagery teach us about how seriously we need to take our faith and the mission that our faith calls us to participate in? Read Revelation 20:1-3 along with Jeremiah 4:23-26. During the millennium, what is the state of the earth? In what way is Satan bound by chains? The 1,000 years (or millennium) begin with the second coming of Christ. At this time, Satan and his fallen angels are chained. The chaining of Satan is symbolic, because spiritual beings cannot be physically bound. Satan is bound by circumstances. The plagues have desolated the earth and killed off its evil inhabitants, bringing it into a chaotic condition resembling the earth before Creation (Gen. 1:2). In such a state, the earth functions as Satan’s prison during the millennium. Because there are no human beings to tempt and harm, all Satan and his demonic associates can do is contemplate the consequences of their rebellion against God. Read Revelation 20:4-6. Where are the redeemed during the millennium? Revelation shows that God’s people will spend the millennium in the heavenly places that Christ prepared for them (John 14:1-3). John sees them sitting on thrones as kings and priests, judging the world. Jesus promised the disciples that they would “sit upon twelve thrones, judging the twelve tribes of Israel” (Matt. 19:28). Paul stated that the saints would judge the world (1 Cor. 6:2-3). This judgment concerns the fairness of God’s actions. Throughout history Satan has raised doubts concerning God’s character and His dealings with the beings He created. During the millennium, God allows the redeemed to access the records of history in order to find answers to all questions concerning the fairness of His decisions regarding those who were lost, as well as questions dealing with His leading in their own lives. At the conclusion of the millennium, all questions regarding God’s justice are forever settled. God’s people are able to see beyond a shadow of doubt that Satan’s accusations were unfounded. They are now ready to witness the administration of God’s justice at the final judgment of the lost. Who among us doesn’t have questions, hard questions, that for now seem to have no answers? What does it tell us about the character of God that, one day, He will give us the answers? After the eradication of sin, the earth will be transformed into the home of the redeemed. What will it be like? In Revelation 21:1, John saw “a new heaven and a new earth”. The Bible refers to three heavens: the sky, the starry universe, and the place where God dwells (2 Cor. 12:2). In Revelation 21:1, the earth’s atmosphere is in view. The contaminated earth and the sky cannot endure God’s presence (Rev. 20:11). The word “new” in Greek (kainos) refers to something new in quality, not in origin and time. This planet will be purged by fire and restored to its original state (2 Pet. 3:10-13). Particularly interesting is the fact that the first thing John observes on the new earth is that there is no sea. John’s reference to “the sea” (with the definite article) shows that he probably had in mind the sea that surrounded him on Patmos, which had become a symbol of separation and suffering. For him, the absence of that sea on the new earth meant absence from the pain caused by his separation from those whom he loved. Read Revelation 21:2-8 and 7:15-17. What parallels exist in the description of the new earth and the Garden of Eden, in Genesis 2? A life free of suffering and death on the restored earth is guaranteed by God’s presence among His people. This presence is manifested in the New Jerusalem and “the tabernacle of God” (Rev. 21:3), where God will dwell among His people. The presence of God makes life truly a paradise in the restored earth. God’s presence guarantees freedom from suffering: no death, sorrow, crying, or pain, which are all the consequences of sin. With the eradication of sin, “the former things have passed away” (Rev. 21:4, NKJV). This idea was well articulated by Mary and Martha at the death of their brother Lazarus: “Lord, if You had been here, my brother would not have died” (John 11:21, NKJV). The sisters knew that death could not exist in the presence of Christ. In the same way, the abiding presence of God on the new earth will secure freedom from the pain and suffering that we now experience in this life. This freedom is the great hope that is promised to us in Christ, a hope sealed in His blood. Why is this promise of a new existence in a new world so central to all that we believe? What good would our faith be without it? John now describes the capital of the new earth, the New Jerusalem. While a real place inhabited by real people, the New Jerusalem and life in it are beyond any earthly description (1 Cor. 2:9). Read Revelation 21:9-21. What are the exterior features of the New Jerusalem? The New Jerusalem is referred to as the bride, the Lamb’s wife. The New Jerusalem is the place Christ is preparing for His people (John 14:1-3). The city is surrounded by a high wall with twelve gates - three gates on each of the four sides, allowing entry from any direction. This feature points to the universal scope of the city. In the New Jerusalem everybody has unlimited access to God’s presence. The city is further pictured as a perfect cube; it is 12,000 furlongs, or stadia, in length, width, and height. The cube consists of 12 edges. Thus, the city totals 144,000 stadia, which reflects the 144,000 who are translated without seeing death at the second coming of Jesus. In the Old Testament temple, the Most Holy Place was a perfect cube (1 Kings 6:20). The New Jerusalem thus functions as the center of the worship of God. Read Revelation 21:21-22:5. What interior features of the city remind you of the Garden of Eden? What is the significance of the promise that there will be no more curse in the city (Rev. 22:3)? The most prominent feature of the New Jerusalem is the river of water of life flowing from God’s throne (Gen. 2:10). In contrast to the river in Babylon, at which God’s people were sitting as captives longing for Jerusalem (Psalm 137), on the banks of the river of life in the New Jerusalem, God’s wandering people of all ages have found their home. On both sides of the river is the tree of life with leaves for “the healing of the nations” (Rev. 22:2). This healing does not refer to disease, as on the new earth there will be no disease. It refers to the healing of all the wounds caused by the barriers that have torn people apart throughout history. The redeemed of all ages and from all nations now belong to one family of God. Further Thought: Read Ellen G. White, “Without a Wedding Garment”, pp. 307-319, in Christ’s Object Lessons; “The Controversy Ended”, pp. 662-678, in The Great Controversy. The book of Revelation concludes with what was introduced at the beginning: the second coming of Christ in power and glory and the establishment of God’s everlasting kingdom. The return of Christ, when He finally will be united with His bride, is the climactic point in the book. However, the book does not put these events in an unrealistic context. That Jesus is coming soon is the first reality. The second reality is that we are still here waiting for His return. While waiting, we must have a clear comprehension of the messages of Revelation, and we can get this understanding by reading the book again and again until the end of all things comes. The messages of the book of Revelation constantly remind us, while we wait, not to look to the things of the world, but to fix our eyes on heaven and on Him who is our only hope. The Christ of Revelation is the answer to all human hopes and longings amid the enigmas and uncertainties of life. He holds the future of this world and our future in His hands. The book also reminds us that before the end comes, we are entrusted with the task of proclaiming the message of His soon return to all the world. Our waiting for His return is not passive, but active. Both the Spirit and the Bride call: “Come!” (Rev. 22:17, NKJV). We must join that call. It is the good news, and as such, it must be proclaimed to the people of the world. Think about the millennium and the judgment of the unrighteous dead that occurs only after the millennium. The saved will have a thousand years to get all their questions answered. Only then will God bring final punishment upon the lost. What does this truth reveal to us about God? Revelation 1:3 promises blessings to those who listen, read, heed, and keep the words of the prophecies of Revelation. As we conclude our study of this book, what are the things you have discovered that you need to heed and keep? Maria Lemos Abel, a Seventh-day Adventist nurse, asked the mother to hold her 2-year-old daughter firmly for an injection of penicillin G procaine to treat a bacterial infection. 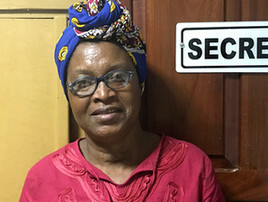 But the mother didn’t heed the instructions, and Maria accidentally jabbed the syringe into her left index finger when the baby jumped in pain at the state hospital in Nampula, Mozambique’s third-largest city with a population of about half a million people. Following hospital policy, Maria immediately ran blood tests on the mother and baby. In 30 minutes, she had the results: both were HIV positive. Maria began to cry. She had worked with many HIV-positive patients, and she knew that the virus is transferred easily through blood. “Lord, help me not to contract HIV”, she prayed. A hospital physician instructed Maria to take ARV drugs, which suppress the HIV virus, twice a day for the next month. After that, she would have to wait another five months to learn whether she had contracted HIV. She also prayed fervently for God to intervene. A half year after the accident, Maria’s results came back negative. She had not contracted HIV. Three years later, in March 2017, a 30-year-old female patient jumped when Maria made a small incision on a swollen arm. The scalpel cut Maria’s left thumb, drawing blood. Maria ran a blood test on the patient, and it came back HIV positive. Maria couldn’t believe it. She wept as she took ARV drugs. She prayed as she waited six months to take the HIV test. The test came back negative. Maria, 51, shares her experience with women hospitalized after sexual assault and recommends ARV drugs and prayer. “I say, ‘God saved me from something that wasn’t my fault, and He can also save you from something that wasn’t their fault,’” she said. At least three women have tested negative after following Maria’s advice. Two were sexual assault victims and the third was a nurse accidentally exposed to HIV at the hospital. “It is a miracle that I have never contracted HIV, and I tell others about the power of prayer and the Lord”, Maria said. Part of this quarter’s Thirteenth Sabbath Offering will help open an orphanage for children who have lost their parents to HIV and AIDS in Nampula, where Maria works. Thank you for your mission offering.